One or more of the preceding sentences incorporates text from a publication now in the public domain: Chisholm, Hugh, ed. (1911). 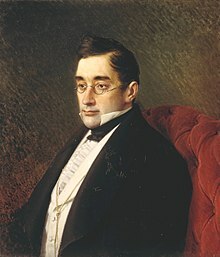 "Griboyedov, Alexander Sergueevich" . Encyclopædia Britannica. 12 (11th ed.). Cambridge University Press. p. 593. Wikimedia Commons has media related to Aleksandr Griboyedov.